The rusted exterior of the Olivier Music Barn always appears when you come around the bend as a pleasant surprise, like the ochre moss-covered rocks from the region. Its monochromatic appearance gives it a modern look, a personality which corresponds with the monochromatic tones of the landscape, the way an instrument folds into an orchestra. Lisa Delplace, the project’s landscape architect, was careful to fine-tune the gradual discovery of the building against the mountain backdrop, like the opening of a curtain in a theater. 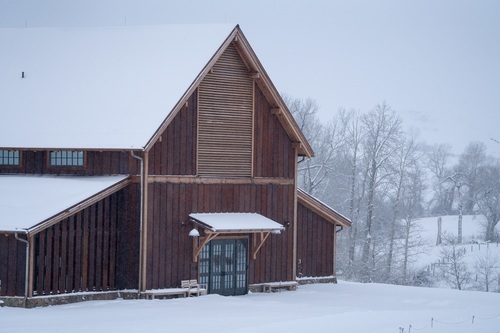 A pitched roof, windows at high level for natural ventilation, large sliding doors, poised on a gentle slope near the cottonwood creek: the Olivier Music Barn has always been there, even before it was built. The all-timber interiors contrast with the all-rusted exterior: the inverse of a shell. A frugal layout of spaces, meant to be functional, uncompromised by aesthetics. I can tell you a long story about great hall rooms. These are the most recurrent room dimensions in history, starting with Solomon’s Temple (with the inner chamber dimensions of a “jewel box”). These used to be 45 x 90 feet and are in every castle in Europe. Originally used for banquets and events, they became the main room for instrumental music and then led to the early concert halls in the early Romantic to the Romantic Era (Leipzig’s Gewandhaus and later the Musikvereinssaal). The Eisenstadt Haydnsaal and a few other great hall examples had been made earlier. Other famous great halls were many of the chancel barriers in cathedrals otherwise too big for music, where concerts were then performed inside the chancel (e.g. Notre Dame). My favorite great hall personally is in Rome, in the Cancelleria, just next to the fountain, which also has a jewel box just next to it, which I love equally. The Cancelleria is my favorite because it is not too long. It is much more enveloping because of the closer rear wall. Another famous great hall is the Sistine Chapel. Sounds in the Snape Maltings space mix in the large high-gambrelled ceiling cavity and float down to the audience, creating a floating sound. Located in the British countryside and converted from a malt storage barn, the 800-seat performance space is informal, rustic, made from brick, wood and exposed timber frames. The campus is laid out like a barn compound with a number of different individual buildings naturally fitting together by the necessity of time, reminiscent of a small medieval village. Like most classical composers, Joseph Haydn composed most of his work for a small number of spaces. It was for the Esterhazy Music Room that he composed his chamber music repertoire. The room is still in use today, proving its quality over centuries. Alban wrote his monograph on its architecture and acoustics. 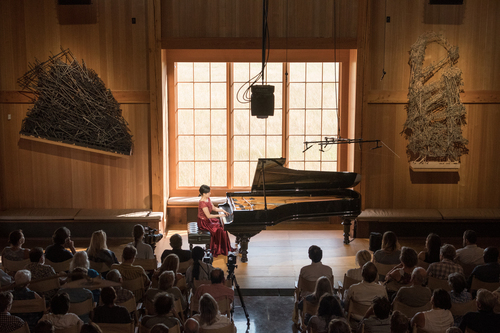 Cathy and I were deeply attracted by its enveloping sound, and so the Esterhazy Music Room (the Fertöd Jewel Box) became the benchmark for the Olivier Music Barn’s design. The room is 35 feet wide and 55 feet long and fits between a cube and a double cube. It is the ceiling which gives a room its determining sound, however. For that, we looked to Arup’s design for Snape Maltings. The Snape ceiling is a unique shape, and gives the music room to breathe. Dimensions can’t quite describe it. From Esterhazy we took the concept of a deep recess for the window, which filters the outside world without letting the view visually overpower the room, inviting the imagination to wander, but not too far. This recess removes the window glass from the sonic profile of the room. Thus the shapes and dimensions of the performance space were derived from the physical properties of sound. The visual design was then adapted to the rigors of the acoustic shell. This is backwards from the usual design evolution of a concert hall. 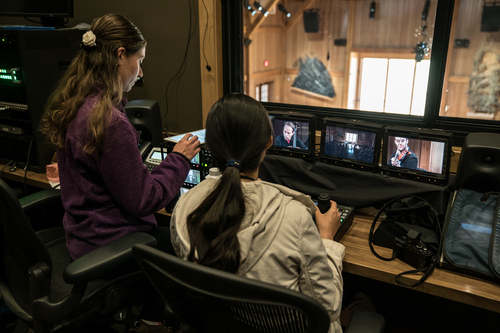 Most architects feel the visual elements should take priority, but we put the sound first. You can always decorate a building after the sound is in place. But you can’t compensate for acoustic mistakes in the architecture. Alban had developed the “SoundLab” at Arup in New York, a room with seventeen speakers arrayed around a sweet spot for the clients, and a screen in the front which shows the architectural plan of the room being heard. As the room dimensions change in the computer and on the screen, the sound also changes, so you could hear the room you were building before building it. You could eliminate windows and doors, expand the ceiling and walls, change the texture of the floor. We could hear the personality of the music diminish as the room expanded, even slightly, from the Jewel Box model. This may sound like a pleasant afternoon in a New York laboratory, but in fact it was trips to London, to Sussex, to new versions of the Snape roof built by Arup at the Seven Oaks School and elsewhere, and thousands of emails and Dropbox folders over the course of three years, before we were ready to build. The cement floor allows for a clean, accurate bass sound, which we intend to temper with a wood floor over time. There will be no air space between this floor and the concrete beneath it. Alban had met Laura Viklund at a Harvard conference. She had since moved to Cody, Wyoming and set up a business, Gunnstock Timber Frames, with her husband, Chris Gunn. We engaged them to sculpt our ideas into architecture. Laura and Chris also designed the three artist residences and Will’s Shed, the dining pavilion adjacent to the music barn. The computer files we produce in the Olivier Music Barn end up on YouTube, on Vimeo, on Performance Today, on the Pentatone label in surround sound, and here, on our website. 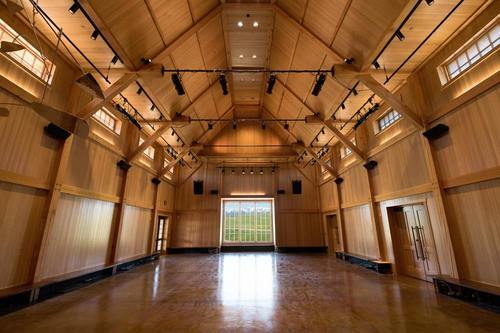 In January of 2019, the Olivier Music Barn received LEED® Gold certification from the US Green Building Council for its environmentally sustainable design and systems. To read more about the Music Barn’s green design and systems, the LEED® certification process, and the USGBC’s globally recognized symbol of sustainability achievement, click here.